Located in the main city of Mumbai, Kohinoor Elite, a hotel in Bandra Kurla complex is an ideal choice for a perfect stay, for business as well as leisure travelers. It is a preferred choice for business travelers, as this is one of the few hotels near Mumbai airport providing budget accommodation. 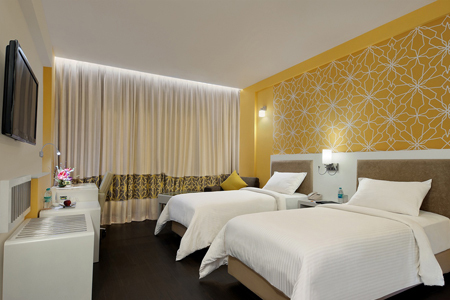 A business hotel, with proximity to the Mumbai International Airport is a novelty in the hospitality industry, making it a popular choice among many transit travelers. With artistic contemporary décor and tastefully decked with all the basic necessities, the hotel will make one’s stay most comfortable. With round the clock service available for the guests, one can never complain. Hotel Kohinoor Elite is a vibrant place providing the best of accommodation, culinary offerings and entertainment and event venues that has achieved an international repute. Guests find it easy to commute to and from the city, as Kohinoor Elite is located right in the center of the city. Leisure travelers find the hotel a haven of ultimate relaxation with varied amenities. Dining options in the hotel are varied and guests can also avail in-room dining when and if they want to dine in privacy. The warm hospitality and excellent service standards of Hotel Kohinoor Elite remains unmatched and being budget-friendly adds value to one’s stay. Book in advance for a hassle-free booking and avoid the last minute rush. One can also stay updated on its Facebook page for ongoing packages and offers to make one’s stay even more remarkable.